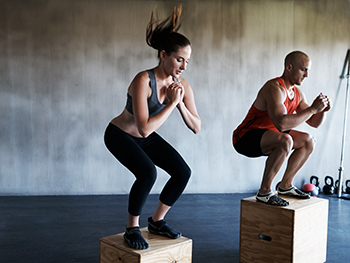 Jumping right into an intense workout routine too suddenly can cause muscle soreness and even rhabdomyolysis. With the new year here, many of us will be flocking to the gym or queuing up exercise videos to get a jump on our resolutions. And with our new workout routines may come muscle soreness. But how sore is too sore and indicates something else? I met up with David Hryvniak, MD, to find out. Mild soreness after a workout is generally not a bad thing. It’s just a sign that the muscle has been taxed. The stress on the muscle causes microscopic breakdown of muscle fibers, which in turn causes discomfort. The muscle breakdown serves a purpose: when those fibers rebuild, the muscle is stronger. Some types of exercise cause more soreness than others. For example, “eccentric” activity (when the force is put on the muscle as it lengthens, such as when running downhill or lowering the weight in a hamstring curl) causes more soreness, because it puts more strain on the muscle. Have you ever been sorer the second or third day after a workout than you were the first day after? This is called delayed onset muscle soreness, or DOMS. The soreness is delayed because it takes a while for some metabolic & physiological processes (the results of those microscopic muscle tears) to manifest as muscle pain. DOMS pain is at its worst 48-72 hours after a hard workout. There isn’t much you can do to treat DOMS. It should improve on its own after about 72 hours. The best way to prevent DOMS is to be sure you’re building up your activity gradually. Massage and foam rolling may help with DOMS. “I generally tell people foam rolling ‘hurts so good.’ It’s painful, but it gets those waste products like lactic acid moving and out of your muscles and soft tissue,” Hryvniak says. Just be sure not to roll directly over bones or joints if you try foam rolling. Stick to soft tissue like your glutes, hamstrings, and calves. Muscle tissue releases an enzyme called creatine kinase (CK) when it breaks down. That’s normal, and a certain amount of CK in your system is fine. But a high amount of it can cause rhabdo, which affects the kidneys and can even cause kidney failure. Unlike DOMS, rhabdomyolysis is a serious condition that requires medical attention. It usually happens when someone jumps right into heavy activity without building up to it. Rhabdo is a dangerous condition, so if you suspect you have it, you’ll want to see a physician or visit the emergency room that day for evaluation. You’ll also want to see a doctor if pain is keeping you from getting back to the same activities once your soreness has gone away. That may indicate an injury. The UVA Runner’s Clinic is the only clinic in the area with a program specifically for runners. The physicians are all experienced runners and board certified sports medicine physicians. They treat all physically active people with a special focus on the endurance athlete. Make an appointment with the UVA Runner’s Clinic by calling 434.243.5600. Warm up prior to intense activity. Stretch well before and after your workout. Keep moving! Gentle walking and stretching after a workout will help keep those waste products from settling into your muscles and help prevent DOMS. Be gradual! If you slowly increase the load on your muscles, soreness will be less of an issue. Most of Hryvniak’s patients end up in his office because of doing too much too soon. Maybe they’re increasing their running distance, adding in hills too quickly or jumping into a workout they’re not ready for. He sees things like stress fractures, Achilles tendonitis, runner’s knee, plantar fasciitis and hamstring injuries.